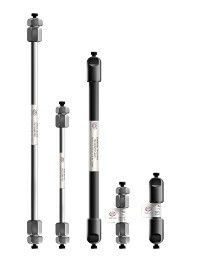 As a manufacturer of the most comprehensive and highest quality LC columns and bulk media, Sepax Technologies, Inc. has developed a wide range of patented and proprietary technologies in the areas of resin synthesis, surface chemistry and column packing that have established Sepax as one of the leaders in chromatographic separation with applications from small pharmaceutical molecules to biological macromolecules, to virus separation and to nanomaterials. We have built up three platforms of resin technologies: silica, PS/DVB and polymethacrylate beads with particle size range from 1.7 to 100 µm and pore size range from non-porous to 2000 Å. On those three support materials, abroad spectrum of innovative surface modificationhas been developed forachieving comprehensive chromatography resin products. Integration of Sepax's silica particle technology and surface chemistry innovation has enabled a complete size exclusion chromatography product lines for biological molecules, including Unix™, Unix™-C, Zenix®, Zenix®-C, SRT®, SRT®-C, SRT®-10, and Nanofilm®. Those products have particle sizeselection of 1.8, 3, 5 and 10 µm and pore sizeselection of 80, 100, 150, 300, 500, 1000 and 2000 Å.
Sepax's non-porous PS/DVB technology offer particle size selection of 1.7, 3, 5 and 10 µm. The non-porous particlehas unique properties of fast mass transfer and minimized lateral diffusion that enable high resolution separation. Integration of non-porous PS/DVB beads and innovative surface chemistries has led to Proteomix® ion-exchangers, Proteomix® HIC and Antibodix™ WCX product lines. Proteomix® SAX, WAX, SCX and WCX offer a complete solution for ion-exchange separation of biological molecules. 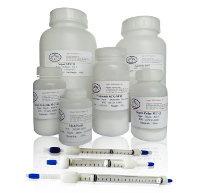 Antibodix™ WCX is specially designed for separation and analysis of monoclonal antibodies. Proteomix HIC series are ideal for hydrophobic interaction separation of biomolecules, such as ADC samples. Among those products, 1.7 µm particle is a leading technology for achieving highest efficiency separation. Sepax's porous PS/DVB particle technology has developed Proteomix® RP and PolyRP™ products for hydrophobic and reversed phase separation with particle size selection of 3, 5, 10, 20 and 50 µm and pore size selection of 100, 300, 500 and 1000 Å.
Sepax's low cross-linking PS/DVB particle technology offer the particle sizes of 5 and 10 µm with cross-linking degree of 5, 8 and 10%. By functionalizing those low cross-linking PS/DVB particles with sulfonic acid (-SO3H), followed by chelating of metal ions, Carbomix® product lines have been developed for carbohydrate separation. Sepax's polymethacrylate particle technology has developed 30 and 60 µm beads with pore size of 800 Å. Integration of polymethacrylate particles and innovative surface chemistries has led to Generik™ MC ion-exchange, Polar™ MC ion-exchange, Generik™ MC-HIC and Polar™ MC-HIC bulk media products for process purification of biomolecules. With more than 10 years of accumulation of column packing expertise, Sepax has developed technologies for packing a variety of LC columns, including micro with ID from 75 µm to 1.0 mm, analytical with ID from 2.1 to 7.8 mm, semi-prep and preparative with ID of 10, 21.2, 30 and 50 mm, and DAC columnswith ID from 50 to 800 mm. Sepax also packs FPLC columns with ID from 6.6 to 300 mm. Sepax has developed a broad scope of unique chemical processes for synthesizing monomeric and polymeric thin films on both flat and particle surfaces. Our unique processes allow us to make neutral, cationic or anionic coatings with a controlled thickness from a few nanometers to more than 100 nm on internal or open surface uniformly. One example is the synthesis of uniform coatings of polyacrylamide or polyethylene glycol on the internal surface of the capillary tubes with ID from 15 to 75 µm. Those coated capillary columns with controlled or reversed EOF provides reliable and highly efficient separation (N >1.5×106/m for 20µm ID column) for Capillary Electrophoresis (CE), which has unique applications in high-throughput analysis, such as proteomics. With more than 100 of chromatographic resins and over 1000 different LC columns manufactured in house, Sepax has accumulated broad scope of expertise on analytical separation method development and purification processes for wide range of pharmaceutical and biopharmaceutical samples, including ADC, Antibody, Biosimilar, Carbohydrate, Cell Lysate, DNA/RNA, Fusion Protein, Glycoprotein, Heparin, Insulin, Membrane Protein, Natural product extract, Organic Acid, PEG/PEGylated Protein, Peptide, Polymer, Protein, Vaccine/VLP.